GSMArena team, 2 January 2015. The image gallery, dubbed Pictures, has a simple interface. You can sort by date or albums, and images will appear in a non-zoomable thumbnail interface. Using the slider on the right will pop up a small image preview in the center. Multiple images can be selected for mass delete and mass share. There are also options to edit the image, start a slideshow or use DLNA to push images to a compatible TV. Viewing individual images gives you the same options. You can move between images by swiping the current image past the edge, or by using QWERTY shortcuts ('p' for previous and 'n' for next image). The Edit option in the gallery app is pretty powerful. The Transform tab in the editor can rotate and flip the image and there's a free transform tool as well if you want to crop out a specific part of the image. Then there's Enhance with the standard image tweaking options available (brightness, contrast, sharpness, noise reduction and so on), as well as a selection of filters. The video player has a very similar interface to that of the image gallery. It can sort by date, library, or favorites, and can display items either as a list or in a grid. You can search for a video, mass delete videos, share them or push them through DLNA to a compatible player. The video player handled all the popular file formats easily, with the usual exception of videos with AC3 audio. Certain XviD files refused to play, and there was even support for MOV files. Another thing that impressed us was the Edit option - it took a 1080p video and offered to trim its start and end points, rotate and crop the video, adjust its brightness, contrast color and sound too. It is unlikely that BlackBerry Classic owners will use the device as a dedicated player often. Unlike the flagship Passport that can do the trick, the Classic is rather limited by its screen size and resolution. The Story Maker app lets you pick multiple movies and photos and puts together a video slideshow with a soundtrack of your choice. There are several different preset styles, which add an effect over the entire video (vintage, bleach pass, etc.). You can go back and add/remove items, rearrange them and put them through the image or video editor if they need to be tweaked. By default, Story Maker saves the resulting videos in 720p resolution. You can switch to 1080p if you like. The music player's UI is pretty similar to the image gallery and video player in how it handles files. The music library can sorted by Artist, Album or Genre and a dedicated tab displays all the playlists. The Now playing interface is pretty simple with prominent album art in the middle, surrounded by playback controls (including shuffle and repeat buttons). If you tap on the album art (or drag it down) you get the current playlist so you can easily jump between songs (swiping left and right to skip tracks doesn't work). There are no playback controls on the lockscreen or the shade on top of the screen, so you'll have to use the volume keys instead. The volume up and down buttons change the volume for short presses or act as skip buttons when long-pressed. The middle button is play/pause. The music player is DLNA-enabled, just like the gallery and video players. There is also equalizer support. But you'll have to use one of the available presets as there's no custom equalizer option available. The BlackBerry Classic may look all business, but it also delivers in the audio quality department. Sure, it’s not the most talented performer around, but it will please even some pretty demanding users. When hooked to an active external amplifier the Classic showed flawlessly clean output, posting great scores top to bottom. Volume levels were very impressive, too, rounding up a great performance. Plug in a pair of headphones and you get a moderate amount of extra stereo crosstalk, but the other readings remain just as good. Volume levels drop significantly to below average levels, though, suggesting that the Classic won’t be able to handle very powerful headphones. 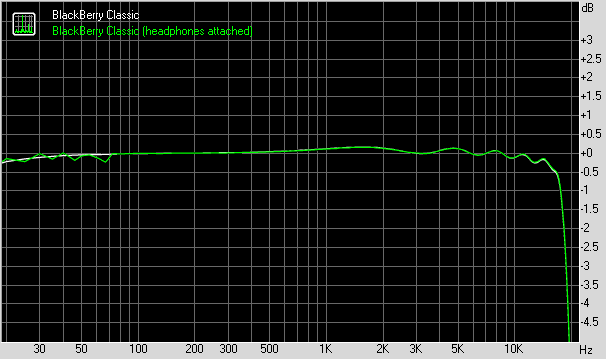 Still, it’s a decent overall showing that will be good enough for everyone that doesn’t require such headphones.